DRPA plow trucks coat the Benjamin Franklin Bridge roadway with salt, Thursday, Feb. 9, 2017. 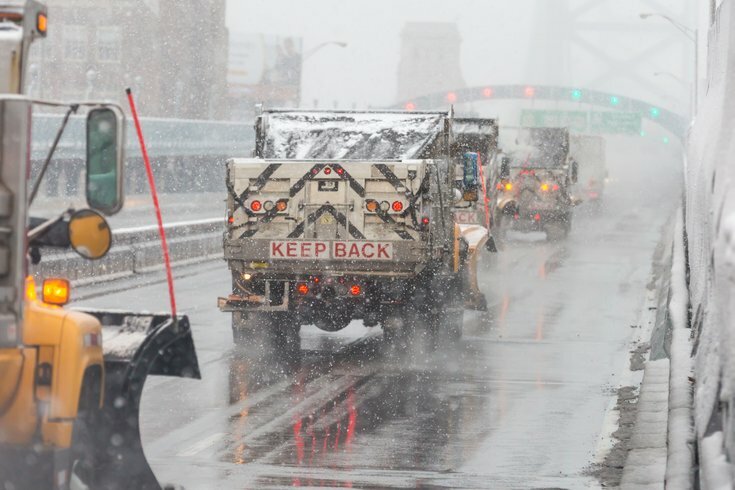 City and state officials are gearing up for a late-season major snowstorm expected to blanket Philadelphia and the surrounding region starting Monday night into Tuesday. The Archdiocese of Philadelphia announced high schools and parochial grade school located with in the city will be closed Tuesday. Archdiocesan schools in the Pennsylvania suburbs will follow the decisions of the public school districts in which they are located. Philadelphia city officials said a “snow emergency” will be declared, beginning at 9 p.m. Monday. That means, by that time, all vehicles must be moved away from city plowing routes, including away from street corners to enable plows to navigate throughout the city. Philadelphia officials said there are more than 50,000 tons of salt ready to tackle this storm. SEPTA officials also are urging customers to plan ahead and avoid unnecessary travel. It has released a list of detours, suspensions and delays already set for Tuesday. SEPTA's weather-related updates will be posted online. Plans in place for Tuesday include Regional Rail service running on a Saturday schedule, in accordance with its Severe Storm Service Plan. The Wilmington/Newark Line will operate an enhanced Saturday schedule and there will be no Cynwyd Line service. The Norristown High Speed Line trains will run every 20 minutes. Several city bus routes will be delayed, detoured or suspended starting at 4 a.m. Tuesday. Additional routes may be affected depending on how much snowfalls and other effects of the storm. NJ Transit has not yet made a weather-related announcement. Several major airlines have announced flight cancellations for arrivals and departures later this week at airports throughout the region, including Philadelphia International Airport. The Philadelphia Streets Department announced that Tuesday's trash and recycling pick ups have been canceled. The department said it will make a decision on Wednesday's trash and recycling collection at a later time, depending on the status of the storm and plowing operations. Across the state and ahead of the storm, Pennsylvania Gov. Tom Wolf has already issued an emergency declaration, which calls for restricted speed limits on all interstates and expressways. The governor is requesting state residents stay off the roads as much as possible Tuesday to promote safety and to help road crews and emergency responders do their jobs. "With more than a foot of snow forecasted for much of the state, citizens should be aware that hazards associated with this storm include treacherous travel due to heavy and blowing snow, as well as possible utility outages and downed trees." CODE BLUE, PHILLY PARKING, PETS, ETC. Homeless outreach: The city has declared a Code Blue. People do not need ID to enter Code Blue shelters or cafes from the street, and they can remain indoors throughout the duration of the Code Blue. If you are concerned about someone who is homeless, please call the Outreach Coordination Center at 215-232-1984 at any time. Outreach is available 24 hours a day, 7 days a week. First responders can also transport people to shelter for their own safety. Philadelphia prisons: All inmate visits are canceled Tuesday for all jails in Philadelphia County. The Philadelphia Parking Authority will not enforce meter and time limit violations after 10 p.m. Monday due to the snow emergency. The PPA will enforce all snow emergency and safety violations. Vehicles illegally parked on snow emergency routes after midnight Tuesday will be subject to ticketing and towing. The Department of Parks and Recreation reminds residents that if a tree falls during a storm and it’s blocking a road, or it has fallen on a house, car or other property, call 911. A crew of arborists from Philadelphia Parks & Recreation are on-call to respond to tree emergencies and they will come out to remove the hazard and any part of the tree that is an immediate risk to public safety. Other parts of the tree that don’t pose an immediate risk (such as tree trunks and stumps) will be removed later so crews can focus on other safety hazards around the city during extreme weather events. If a tree has fallen on electrical wires, please call PECO’s emergency line: 1-800-841-4141.